We have what most people would consider a large family. What most people don't realize is exactly how much my skinny little children eat on a daily basis. I cannot count the number of times I have heard, "Wow, that baby can sure pack away the food, huh?" Drew at Christmastime was a perfect example. He would easily eat an adult-sized portion at most meals. Three slices of ham? He thought they were tasty. A whole slice of prime rib? No problem! This kid eats. 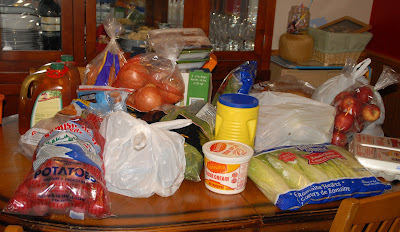 And we say, "Dang, we need to go grocery shopping!" Yeah, it tends to make things interesting. And try to fit it all in the previously pictured fridge. We do have another fridge-freezer combo out in the shop, but it is hard to keep track of what is in there. I tried the list on this fridge, but would forget to cross things off when I sent my wonderful hubby out to get something. 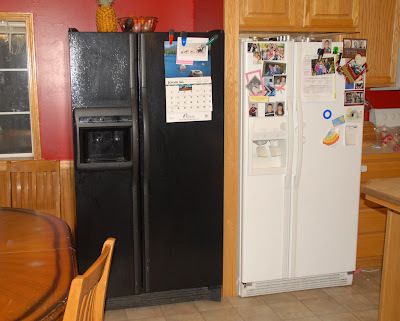 Also, when I was cooking and needed something, I could not leave the house with food cooking on the stove, and four small children inside in order to go out the front door, across the driveway, into the shop, and be completely out of sight while I got what I needed from the other fridge. Oh, and it's cold out there. And I'm a wimp. And yes, there usually is a dishtowel on the floor. I have no idea why. It just happens. We are now the proud parents of side-by-side side-by-sides. I have to say, I love it. We weren't sure at first how well it would work, as the table actually goes in front of the black fridge (it is moved in the picture in order to get the fridge in.) Yes, it's a bit more crowded, but the ability to see into the back of the fridge, as well as the ability to have enough food to last us a full week without having to pack four kids to the store as often to get milk is fantastic! My fridge is overfull and we only have TWO kids....one of which who eats like a BIRD (Bubbalu) so I COMPLETELY see why two side-by-sides is necessary! I have no kids and I want this, unless Lonnie counts as a kid, which he may well. You are a lucky lucky woman. Oh and are those chairs working out? I'm cleaning out the last of that furniture... would you like more if I find any buried in the back? I love it. I only have 3 kids, but they EAT. For a snack, they eat more than most kids will eat in a whole day. 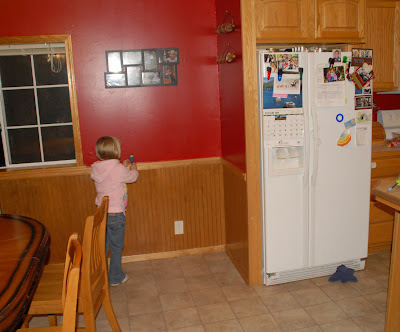 Though, on my fridges, I have to put a childproof lock or the boys help themselves all day long.